“The island (shown) is about 90 kilometers (62 miles) by 150 kilometers (93 miles) across, about the size of Kodiak Island in Alaska or the Big Island of Hawaii. The island may actually be a peninsula connected by a bridge to a larger stretch of land. As you go farther down the image, several very small lakes begin to appear, which may be controlled by local topography. "We've always believed Titan's methane had to be maintained by liquid lakes or extensive underground 'methanofers,' the methane equivalent of aquifers. 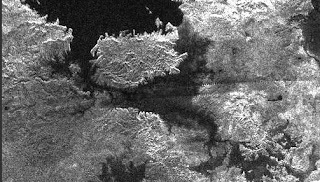 We can't see methanofers but we can now say we've seen lakes," said Jonathan Lunine, Cassini interdisciplinary scientist at the University of Arizona, Tucson. Since lakes come and go with the seasons, they wax and wane over time. Winds might alter the roughness of their surfaces. Repeat coverage of these areas is expected to provide more information on these lakes. By passing over a lake in a different direction, Cassini may see the effect of prevailing winds in the changing brightness of the lake surface. On later passes toward the end of its prime mission, Cassini might see changes in the shape or size of lakes as winter yields to spring in the northern hemisphere.